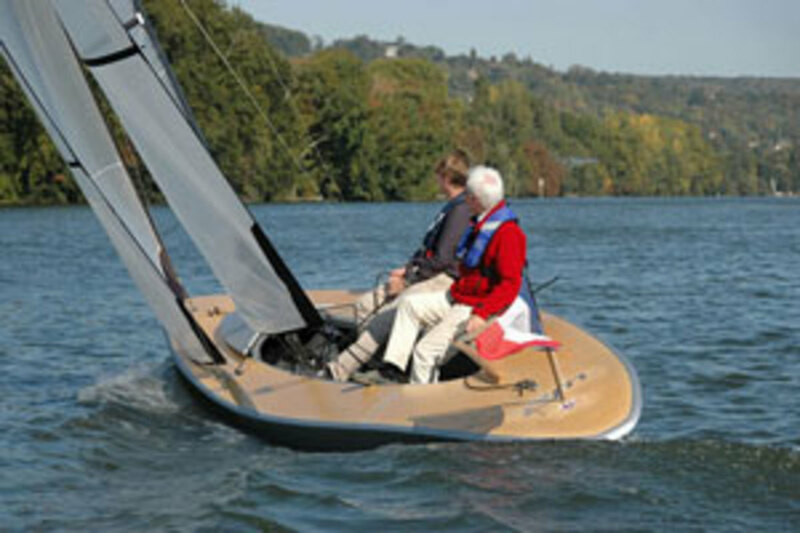 With a beam of less than 5ft on an overall length of 23ft, this daysailer promises exciting upwind sailing. There's a lifting T-keel to facilitate trailering and a high-aspect-ratio rig. &lt;object classid="clsid:D27CDB6E-AE6D-11cf-96B8-444553540000"
This past fall I had a chance to sail the Class 2M, a 23-foot sloop with a retracting bulb keel that was one of the most eye-catching boats at the 2010 Newport International Boat Show. Long and lean, with a maximum beam of just 4ft 11in, the deck constitutes an unbroken series of sweeping curves, all the way from the blunt destroyer-style bow to the wonderfully long reverse transom. Light-colored bamboo decking and metallic gray topsides emphasize the boat’s clean lines. The hull is vacuum-bagged vinylester and fiberglass. The cockpit is a sculpted oval—you sit on the side decks—that blends into a small removable cuddy forward of the mast. There is a lip under each side deck for hooking your feet when hiking out. Hiking straps are an option. The fractional square-top rig spreads 290 square feet of sail on an aluminum spar and is simple by design. There is a vang, but no main traveler. There are fixed sheet leads for the roller-furling jib and the option of a spinnaker. The French builder Naval Force 3 describes the 2M as a “true upwind keel boat” and hopes there will be enough interest to create an exciting one-design class. Ultimately, though, the boat is intended to serve as an elegant daysailer. Underway, the 2M is nimble, yet stable. The published displacement of 992lb seems a bit optimistic, but the boat is still very light. SAIL associate editor Meredith Laitos, a veteran of the Northwestern University sailing team, insisted we try some roll-tacking during our test sail in Newport, Rhode Island. But this was a challenge with a 484lb ballast bulb at the bottom of the boat’s 5ft 3in high-aspect keel. Both on and off the wind, the boat tracked well and was a joy to steer. It was also refreshingly predictable. Ideally, I would have liked a bit more wind, but the 2M responded to the slight puffs we had like a true keelboat, digging in and powering ahead, immediately translating the increased pressure into forward motion. With that big square-top main overhead there’s certainly no shortage of horsepower. The boat also turned on a dime. Despite the profusion of moorings and a nearby finger pier, threading our way back to the dock was a piece of cake. As a side note, I was pleased to discover that the polished bamboo deck was not as slippery as it appeared when I first examined it during the show. Of course, with all sail controls led to the cockpit, there is little need to spend much time traipsing around the foredeck anyway. The mainsheet is cleated forward of the elegantly sculpted tiller. Jib sheets are led under the side decks, preserving the boat’s clean lines. The rudder and tiller are both mounted in a removable cassette, which can be easily be swapped out for a small electric motor to help you back home in a calm. I enjoyed sailing this fast, good-looking boat.